« Where there is light, there is LIFE », said a wise men met during this mission. This first mission to Guinea, in the Kankan region, Mandiana prefecture, took place in 3 stages. It is in the small village of Gbillin (900 inhabitants), about 15 km from any roads suitable for motorized vehicles, that our volunteers first dropped their luggages and tool bags. 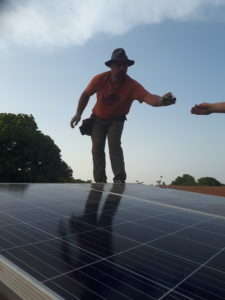 The program : electrify the health clinic with photovoltaic panels and install a fridge, to keep vaccines and medicines. 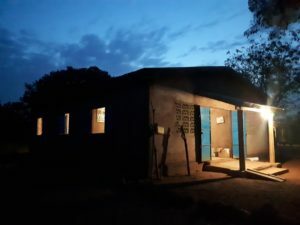 The village’s primary school also received the same type of equipment, allowing evening classes and catch-up classes. In fact, one of the first students of the school who had completed his studies at university. A very symbolic moment ! 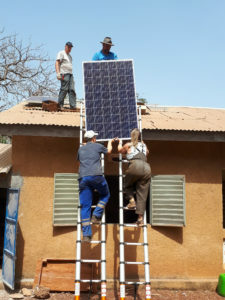 With this experience, the team performed similar missions in record time and always in a good mood in 2 neighboring villages, Loïla (3900 inhabitants) and Faranindoun (8447 inhabitants), each building bringing its share of surprises and technical specificities. 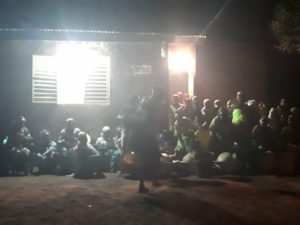 In the evening, the women sang and danced, to the sound of calabashes and djembes, in front of the health clinic, happy to be treated and give birth in better conditions. A big thanks to the residents of Gbillin, Loïla and Faranindoun for their help in carrying out these projects and for their generous welcome. 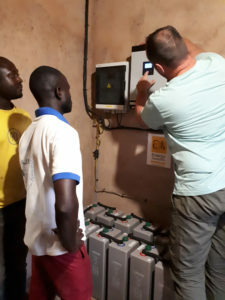 Thank you Dramane K., electrician in Kankan and our guide and translator on site. Thank you Dominique K., Marcel B., Geoffroy R. and Sylvia B. for their dedication on the field and thank you Roland R. for the good follow-up of the project.